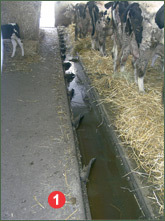 380/660 three-phase designed and inspected to resolve manure storage problems at a distance of approx. 50m from the collection and in low temperature conditions outside the stall. 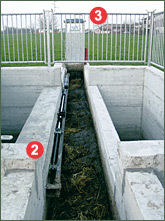 1 – Dung removal phase inside the stall by means of a channel in which the dung is conveyed by a rigid rod with blades, in steel or cast iron. 2 – Oil-pressure pushing unit towards the “Talpa” (3). 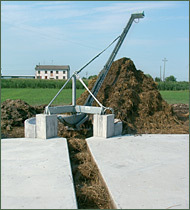 4 – Manure collection point equipped with ejection pipe, height 5m. 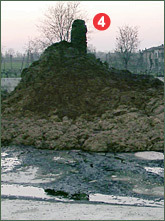 Revolving elevator 180° for manure removal. 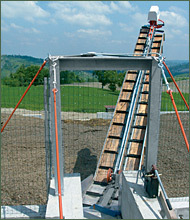 Lengths up to 10 metres. Mechanical propulsor unit on handling side. 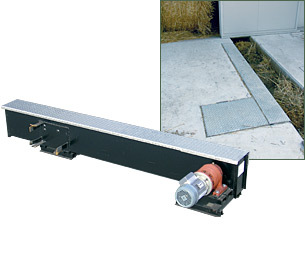 Model GPO Fitted with a galvanised inspection case, ideal for transferring manure in the stall up to 40m. Motorization 2 and 3 CV. 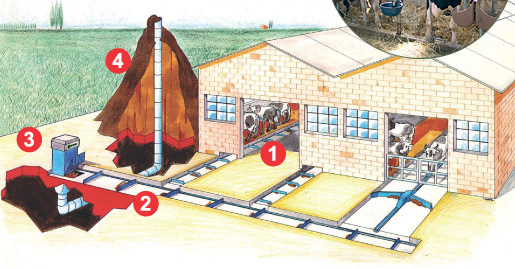 By means of underground ducts, it pushes the dung towards the collection point situated up to a distance of 50m.